I have been making some pieces sheerly out of delight and experimentation lately. 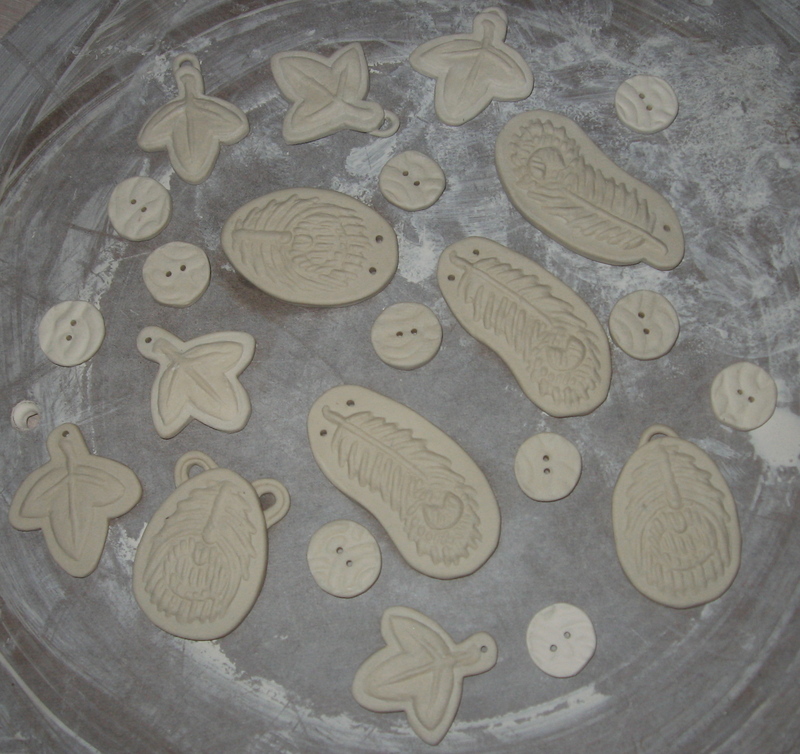 Utilizing thrown parts and pinching/sculpting I made 4 jewelry stands, and slabs with sprig molds or stamps for porcelain buttons and pendants. Buttons with maple leaf and peacock eye feather pendants. My acute interest in Japanese textile patterns and expressions of mathematic beauty in nature inspired the maple leaf, wave pattern, and peacock motifs expressed in these prototypes. The four jewelry stand prototypes. 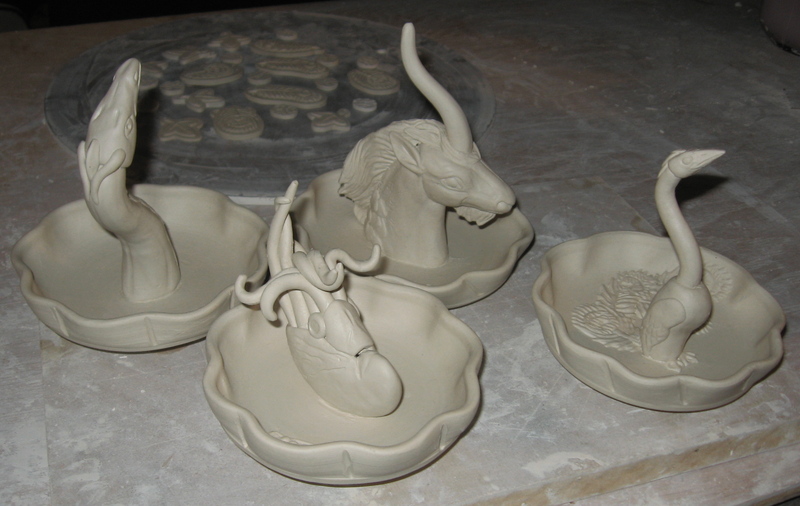 The figurative elements, from left to right: dragon, nautilus, ki’rin, and phoenix. Again, a deep love of mythology, Japanese tattoo imagery, and mathematic beauty expressed through the Fibonacci spiral by the cephalopod shell inspired my selection of critters. The dragon is fairly self-explanatory, based primarily on Western image reference, and the nautilus is a stylized representation of actual life. The ki’rin incorporates an amalgam of mythological beasts, from both Occidental unicorns and Japanese ki’rin and the statuary of M. Pena. The phoenix more closely resembles the peacock-feathered version found in traditional Japanese tattoos. While 3 of them feature a standard single stem for keeping rings, the tentacles offer numerous hooks for ring display. Although the hand sculpting required to develop the small-scale creatures consumes a lot of hours I truly enjoyed the process. After a “break” of making some more mundane functional objects I fully intend to churn out another batch. I got another bisque firing pushed through, with minimal cracking on 1 piece. The two trophy re-makes got loaded into a gas kiln today. I’m reserving the rest for a salt firing the week after next. 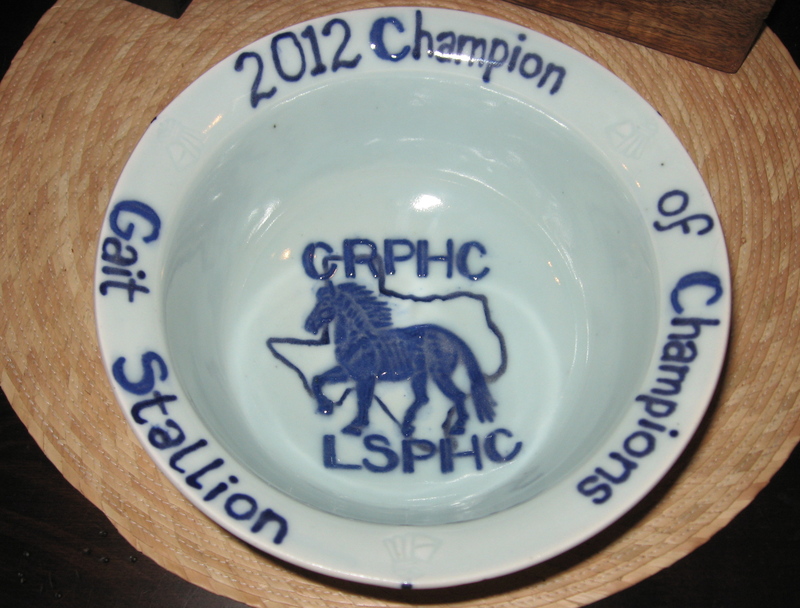 The CRPHC/LSPHC horse show approaches, and now I’m right on schedule to have everything done for the 11 trophies plus pot sale display. To tide you over until I have some fresh pots completed, here’s a photo of the Kristin Kieffer bowl a close friend gave me as a birthday gift. Perfect size for a cereal bowl, and gorgeous to boot. Photo borrowed from the artist’s etsy listing. 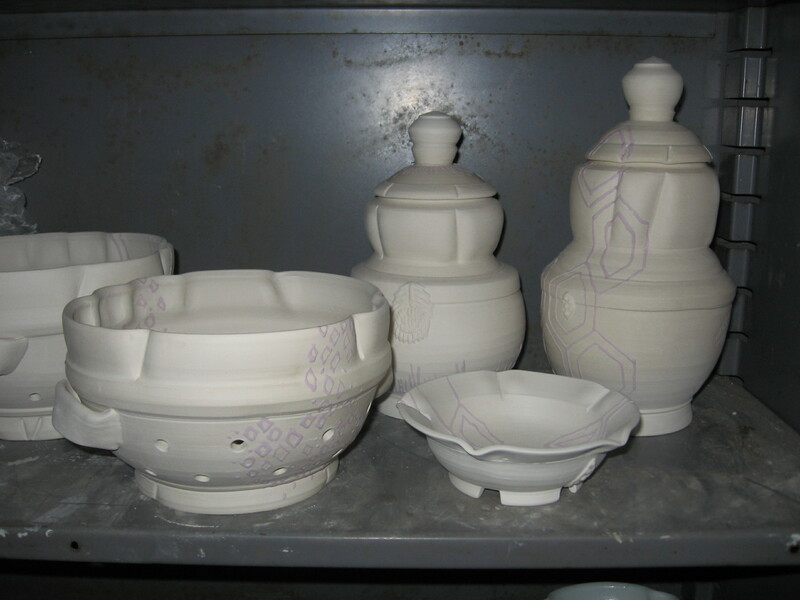 Well, the results came in on Tuesday, when James cracked the kiln to unload. They turned out just like I planned, for the most part. I did have 2 that touched another kiln shelf as they shrank in the gas firing, and 2 with cracking problems. I should be able to dremel, re-touch with glaze, and re-fire the 2 with touched rims, hope not to have to re-make those. Regarding the cracked pieces, 1 has a minor compression crack in the rim, the other has an impressive crack along the foot ring and outside wall curvature. That ship would sink, so to speak. I ought to re-make both, so I probably will. The re-makes will slow down my completion date, but that won’t cause any problems because they’re not due until September. They’re a time hog to decorate, though. Ohata kaki glaze and tripod porcelain foot ring. I wax resisted the rim and entire foot ring before applying glaze, to keep visual unity in the bowls from top to bottom. I am thoroughly happy with the glaze results, as both were reliable from piece to piece. Even the damaged bowls had flawless results. A view to highlight the precisely flared rim. 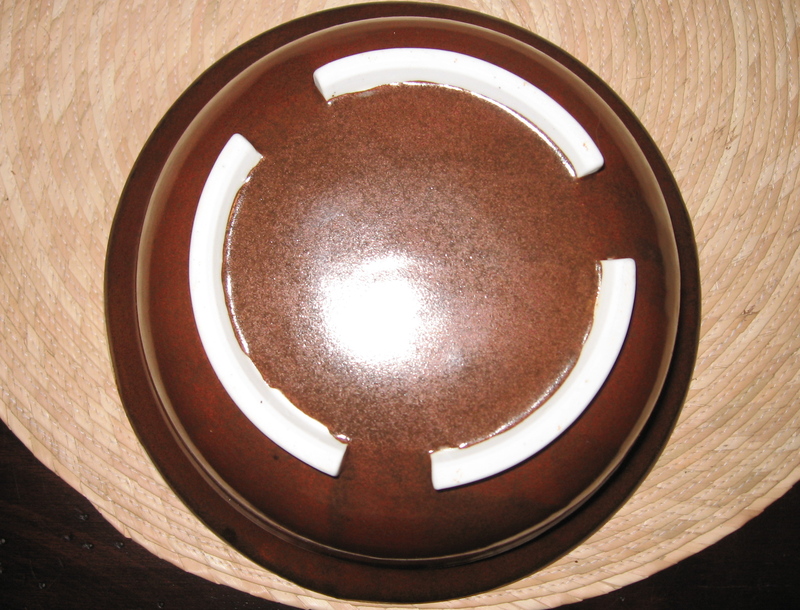 The bowl interior features the logo of both regional Peruvian Paso horse clubs who host a regional Texas-based Peruvian Paso horse show. I carved sprig molds of all the capital letters and the relief Peruvian Paso horse in motion, then slip-trailed the rest. Helpful tip: make sure you carve all sprig molds in reverse, so they read the correct direction once you lift them out of the mold and flip them over. Of course, the current year and show title adorn the flared rim of each trophy bowl. I look forward to seeing how the successful recipients react to their prizes this fall. I made an unplanned trip to Addison yesterday to the Craft Guild of Dallas to help instructor Potter James fill the gas kiln. 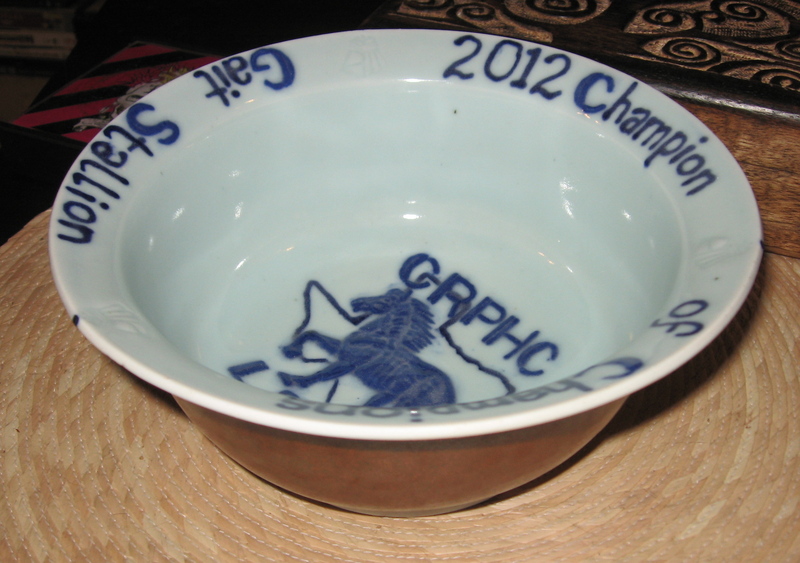 I glazed all 12 of the horse show trophy bowls shown in my previous posts in double time, from 2-6 pm. I used my own batch of Pinnell Celadon from home as the interior glaze, leaving the outermost rim band bare of glaze. Celadon is pale jade green and transparent, which will display the decorations underneath nicely. Then I sponged on wax resist to keep the outside glaze from sticking to the bare rim and first 1″ of celadon glaze. 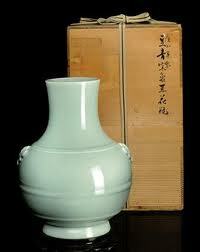 Example of Celadon, on a beautiful 18th century Chinese Hu vase. 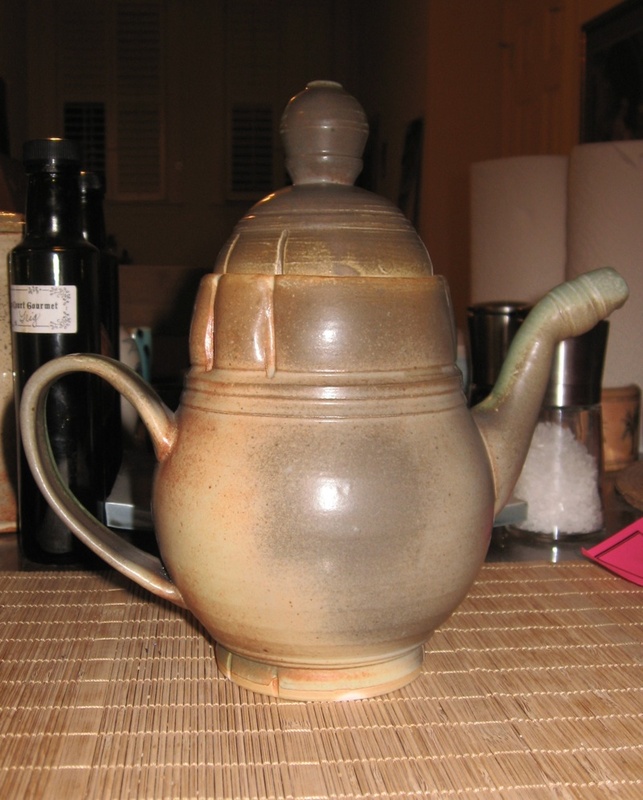 I used the Craft Guild’s Ohata on the outside, a nice dark Kaki glaze. Kaki glazes use an overabundance of iron oxide for coloring, which results in a shiny finely speckled rust, brown, and black surface. 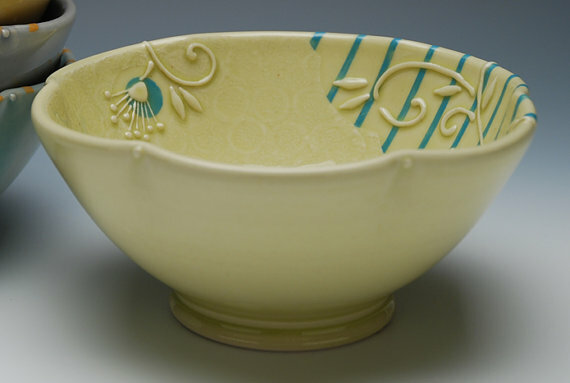 This glaze is very reliable, and I though the pale jade green glaze, dark blue decoration, and rich brown glaze color combination would be appropriate for the earthy, elegant nature of a horse show. I waxed the tripod feet up to the bottom surface, allowing the Ohata to coat the cut out channel along with the outside walls and inside the foot ring. A good example of Ohata on some faceted bottles. Actually, Celadon and Ohata are both colored with iron oxide. 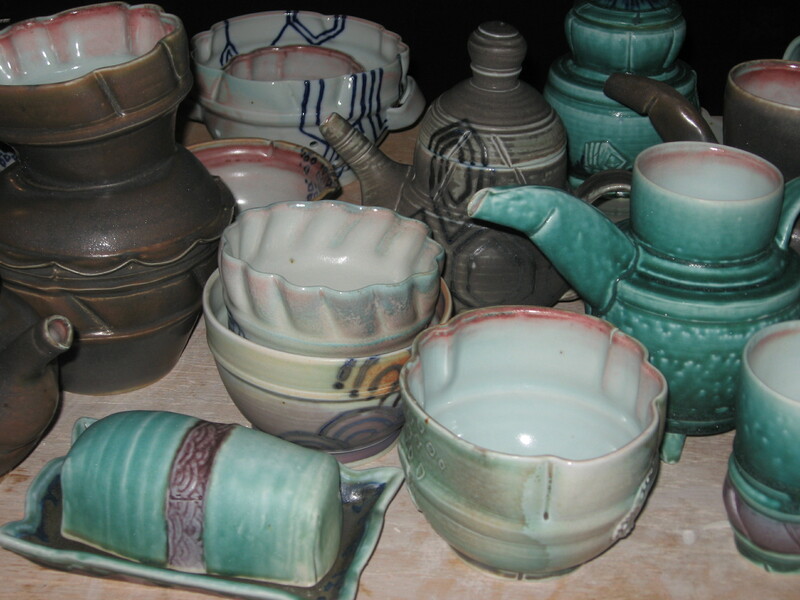 Celadons use a small amount per batch, usually 2-5% of the total gram volume or so. Ohata probably uses about 15-20%. Iron oxide is extremely intense, even in the raw state it gets on everything and doesn’t wash out too easily. 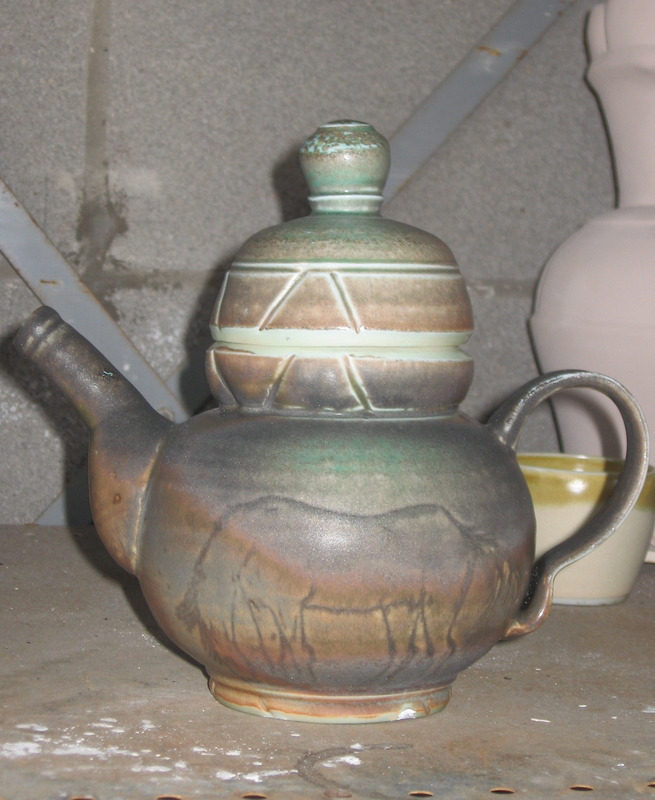 Which may be why over-saturating the glaze past the point of opacity with iron creates a color family similar to iron oxide stones found in nature. I’m excited to see how the trophies fire out, and I fully anticipate success. Okay, if I need to re-make one I’ll bull through it, but hopefully no more than that. I expect to be able to show you the finished pieces by Monday or Tuesday. From the time of my sophomore year in college, I have heard about the complexity and difficulty inherent in executing a successful teapot. “Phaw,” I scoffed, “the parts aren’t so hard to throw, and I’m good at centering. No biggie.” Right? I was so wrong. Problem 1: Numerous assembled parts can become heavy. Tons-of-bricks-teapot + tea = unpleasant to lift. Problem 2: Visual continuity of separately conceived parts (body, lid, spout, handle) is a difficult aesthetic process. 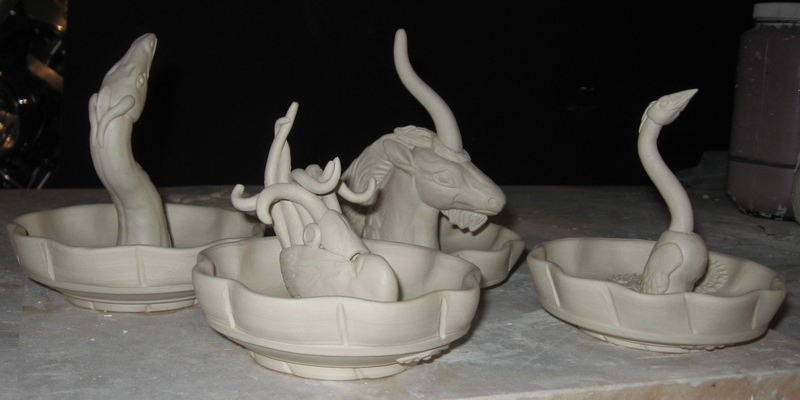 Problem 3: Warping of the body due to spout and handle pulling on the body during firing, trapping the lid forever. 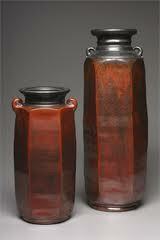 Problems 4, 5: Glaze sealing the holes allowing fluid passage into the spout or glaze sealing the lid in place. Problem 6: Successful glaze outcome. I have been progressing in this area concurrently. 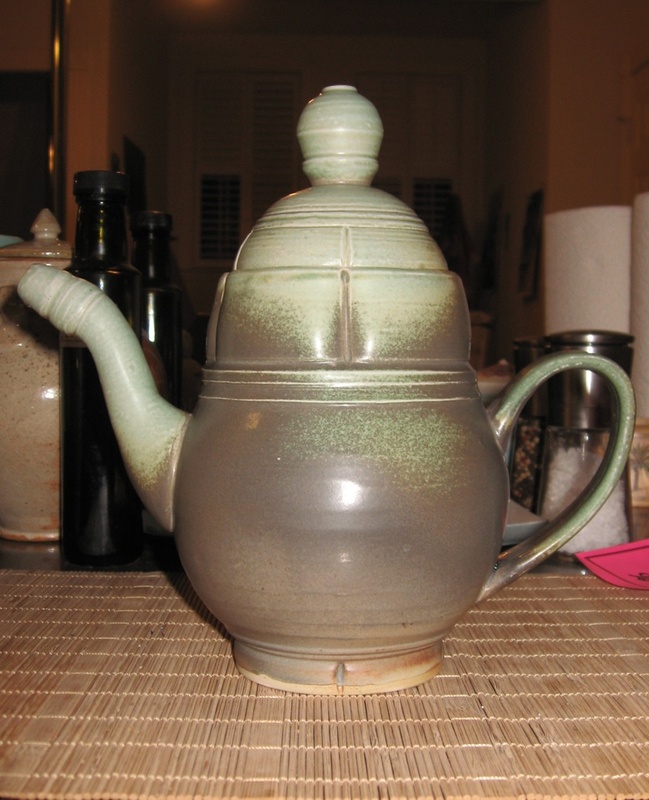 Proper overall weight, thin walls, good aesthetic relationship of all assembled/trimmed parts, nice pouring arc from spout, clean pouring cutoff, snug lid fit, and nice glaze job. White stoneware teapot salt fired to cone 10, glazed with Ryan's Green-black. All parts thrown on the wheel except for the pulled handle. I accidentally met all of these criteria while making a teapot for fun from a spare bag of white stoneware. It’s not absolutely perfect, and there are improvements to be made in future teapots, but this is a good prototype to lead the way. Here's the other side of the same piece. Salt firing causes a lovely directional variation, and this glaze is quite responsive.